The QuadJoy 3 is easy to use; hold the hygienic stick with your lips, then control the cursor on the screen with the movement of your mouth. This is the full package, including the 24″ Flexible Mounting Arm, 6′ USB Cable, two Hygenic Sticks, six Saliva Filters, and a spare Coupler. 100% Plug & Play USB. Bluetooth will allow the Quadjoy 3 to connect with Bluetooth compatible computers and Android devices. Improved movement accuracy and smoothness, with adjustable cursor speed. Elimination of cursor drift and stick dead band problems. 48 edge mounted LED indicators to guide the user through the Puff & Sip and stick initiated functions. They are dimmable to avoid eye strain. 12 Function programmable Puff & Sip system, includes scrolling. Programmable cursor motion control to accommodate the user’s range of motion, desired cursor speed, and absolute or incremental cursor movement. Quick change Hygienic stick with integrated saliva filter. 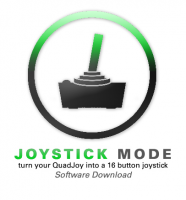 Includes OnScreen - an on screen virtual keyboard that you can use with the QuadJoy 3. No tools necessary for setup and mounting! The QuadJoy 3 is easy to use; hold the hygienic stick with your lips, then control the cursor on the screen with the movement of your mouth. This is the QuadJoy 3 unit only. It does not include any mounting accessories, cables, etc. Note: Revenue Canada requires a M.D. note to expempt this item from HST - Conact us for a Sample M.D. Note.